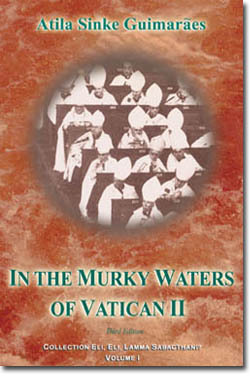 A recently published book with the provocative title, In the Murky Waters of Vatican II, has come to our attention. We would like to make our readers familiar with it and, at the same time, add to our commentary on the book some insights of our own. The author is a Brazilian named Atila Sinke Guimarães and the book is published by MAETA, a Louisiana based traditionalist publishing company. Guimarães is a disciple of Professor Plinio Corrêa de Oliveira, the founder of the Brazilian Society for the Defense of Tradition, Family and Property (the TFP). Professor Plinio was among those few people who saw the handwriting on the wall even before Vatican II. His classic work, Revolution and Counter-Revolution, made a profound impact on Catholic traditionalists fighting for the Faith in the world’s most Catholic country, Brazil. Plinio’s stand against the novelties of the Conciliar progressivists affected millions of Catholics, especially in Latin America. In the beginning of his book, Guimarães spells out his thesis, which he develops with great precision in the remaining pages: “Ambiguity [in the Council texts] leads to a spirit of tolerance toward the world and false religions.” He points out the obvious fact that the texts are indeed ambiguous. This he proves from the texts themselves, with corroborating evidence from Council Fathers and periti. Men who ran the gamut from “conservatives” to outright radical Modernists all agree that the texts are ambiguous. From there he discusses why they were ambiguous. While some might accuse the author of rashly judging intentions, he supports his assertions with the words of the very authors of the texts and bishops who voted for them. The results of these ambiguities are concessions to false religions and the world – both of which were perennially understood as enemies of the Church. (Even Our Lord refused to pray for the world – “I pray not for the world, but for them whom thou has given me ....” John 17:9) From these concessions comes a great crisis of Faith and Morals. And it only took 453 pages! Actually 352, if you don’t count the index, bibliography, and a lengthy appendix. The book does not pretend to settle the issue of the Council. The author makes it clear that the Magisterium of the Church must make the final judgment, but he provides a wonderful resource for the work of some future Pope to infallibly separate the wheat from the chaff in the Council texts. 1. “The conservatives arrive at the Council not organized among themselves but confident that the dogmatic schemata prepared in the pre-Council will be approved. The progressivists arrive very well organized and ready to make their best efforts, but uncertain of victory. 2. “Right at the opening of Vatican II, by declaring that the Council was predominantly pastoral and relegating dogmatic questions based on the traditional teaching to a secondary plane, John XXIII disorients the conservatives. With the withdrawal of the schema De fontibus Revelationis by the express desire of John XXIII, nearly all the remaining schemata of the Council are dropped from the agenda. The conservatives show discouragement and resignation. 3. “Alleging pastoral attitudes, the progressivists introduce into the schemata ideas of adaptation to the world and different religions. The conservatives protest against some of them. Paul VI, directly or indirectly, uses his authority to silence the conservatives and give the victory to progressivists. Faced by contradictions with traditional doctrine, the conservatives accept them only by force of the pontifical authority and under the allegation that they are pastoral attitudes. This tactic is used until the end of the Council. 4. “Once Vatican II is over and victory clearly won by the progressivists, they gradually begin to say that the Council was not only pastoral, but also dogmatic. Their tendency is to accentuate the doctrinal aspect of the victories obtained. 5. “The conservatives, on the contrary, once Vatican II is over, begin to stress its pastoral aspect. Their apology seeks to demonstrate that, since the Council was pastoral, it does not require obedience as dogmatic ones do. 6. “In the post-conciliar period, when the possibility of a conservative reaction arises, the Vatican leadership uses its power and prestige to try to destroy the reaction by alleging that the Council was dogmatic. The sketch we have just cited may well serve as a history book model for years to come. As for our insights, they come not as results of the kind of thorough historical research that the author used (15 years of research producing 14,000 quotes from 900 authors), but from the experience of our Order fighting to preserve the one key doctrine which is anathema to the liberals. It is plain from the thorough documentation in this book that the progressivists sought to radically redefine the Church. Religious liberty, collegiality, and ecumenism were all just small planks in the large platform, which was the destruction of our Church’s understanding of herself. What amazes the reader through the whole of this volume is the pathetic helplessness of the conservatives at the Council. They were all tragic heroes: Lefebvre, Oddi, Ottaviani, et alia. Why were they so powerless against the onrush of the liberal tidal wave? Was it purely the lack of organization mentioned in the first point of Guimarães’ historic outline? In case you are wondering, that last sentence was 123 words! So, according to Rahner, the conservatives gave his radical teachings concerning the salvation of non-Catholics “little opposition.” Of course, Rahner is mistaken when he says there was no “setting of the stage.” The stage was set when Fr. Rahner’s fellow Jesuit, a true hero, was given the status of a villain for his doctrinal stance on salvation. One of those guilty of this villainization was none other than Cardinal Ottaviani, who, thirteen years before the Council, signed a letter condemning Fr. Feeney. The stage was set and Cardinal Ottaviani was one of the stagehands. This Cardinal was the man who sounded the alarm about the destruction of the Mass and who played the part of Ezechiel the prophet pronouncing woes on the liberals in the Church. (We know a priest who was a seminarian in Rome immediately after the Council. He tells the story of Cardinal Ottaviani warning him and other seminarians of the terrible time that was soon to befall the Church.) How, then, are we to believe that someone like Cardinal Ottaviani was guilty of helping to cause this undermining of the identity of the Church? In order to answer this question, we will make a comparison between the Church and her Divine Founder. Among the many theological definitions of God is “the necessary Being.” This means that everything but God is not only contingent on Him, but unnecessary. All created things – all that is not God – are, by their nature, unnecessary, even Our Lord’s created humanity and Our Lady herself; though, in the order of Redemption both were quite necessary. If someone believed every single article of the Catholic Religion – from the Trinity to Papal Infallibility; from the Immaculate Conception to purgatory – but rejected God as “the necessary Being,” saying that God could conceivably have not existed, that person would become a pagan. He could go to Mass, believe in the Sacraments, pray the Rosary, etc; but once he said that God could have not been, he no longer believes in the true God. When God instituted His Church, He gave her an attribute in the order of grace similar to His similar attribute of necessity. God is the necessary Being and the Catholic Church is the necessary Church. The Church isn’t necessary the same way God is, but she has been made by Him the absolutely necessary vehicle for salvation. This is why we have always called the Church “the society of the elect.” Once someone denies her uniqueness, he can believe in every other orthodox teaching about the Church – he can believe in the Papacy, the priesthood, the Sacraments, the authority of the Church to condemn heresy, etc. – but as soon as he denies the absolute, unconditional, and total necessity of membership in the Church, he has rejected something basic to the very nature of the Church. In order to accomplish their goals, the liberals had to bury extra Ecclesiam nulla salus. That done, they were free to continue their agenda. It seems to us, then, that the conservative Fathers at Vatican II were so powerless because they were vitually all weakened to some degree by the error of the liberals: That is, that in the bottom line, the Church is not necessary for salvation. 1. Theological Investigations, vol. 16, pp. 283-284, our emphasis. Br. Francis is the director of St. Benedict Center.